The club sponsorship of RYLA students was very much a last-minute thing this year—the Sierra Vista club candidates were placed on a wait list—Jordan and McKenna were not notified until the night before RYLA began that they could go. 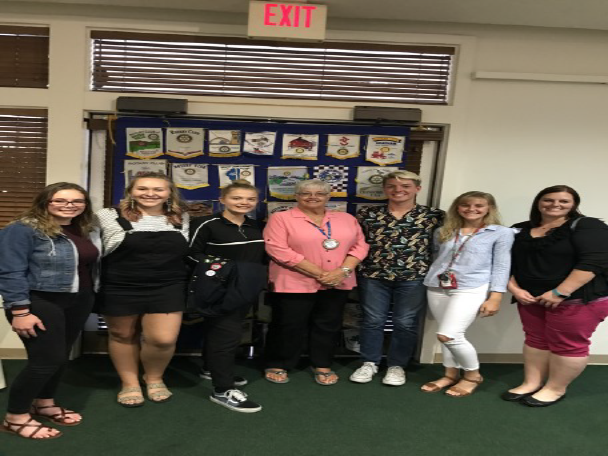 Kaylis Murdock talked about the Interact club and RYLA; Nana gave a brief outline of her stay and her June 8 departure for Denmark. Jennifer spoke about being Nana’s 3rd family. The RYLA students began—McKenna Heck’s favorite memory was a scavenger hunt that focused on the pillars of concern and on discussing problems in the mother/child sector and working on solutions as well as the use of the 4 Way Test in ethical decision making. Joanna Murdock talked about meting people of different ages and the "color tests" for personalities. Jordan Jackson said that her sister went to RYLA and she liked being placed outside of her comfort zone and growing because of that. Marlee King and James King talked about his being an outbound student to Brazil and her pride in her son. Jennifer (Nana’s new host mom and a member of the Sunrise Club) talked about the local Interact and Rotoract clubs and their various combined activities, including a festival of trees, collection of toys, and Project Graduation. Jennifer also talked about finally having a "daughter" and being able to shop for prom dresses with Nana. Nana talked about being with her third family and about the differences in interacting with teenaged "brothers."